Common translations of the noun ‘stof’ are ‘dust’, ‘substance/material’, and ‘cloth/fabric’. The translation ‘material’ can also be used figuratively in which case it means ‘(subject) matter’. When somebody is ‘kort van stof’ (the phrase is used with the verb ‘zijn’), he or she does not use many words to describe the matter (hence ‘brief, concise’) or the person just doesn’t talk a whole lot (in general). The opposite is ‘lang van stof zijn’ (to be long-winded). – “Een man van weinig woorden”: lit. a man of few words, this is to describe a man who does not need many words to make his point. You can also use ‘vrouw’, but it is less common as a fixed expression. – “Kort en bondig”: (brief and) to the point. This expression has a positive connotation. – Beknopt: concise, briefly-worded [adjective]. – Stof: material, subject matter [noun] [de stof, de stoffen]. (Plural form absent in case of ‘subject matter’ translation). 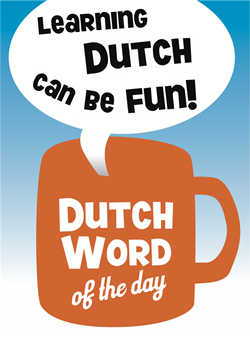 This entry was posted in Dutch phrase of the week, DWOTD 1.0, Vocabulary Intermediate and tagged beknopt, kort, kort en bondig, kort van stof, kort van stof zijn, lang van stof, lang van stof zijn, stof by Sander. Bookmark the permalink.